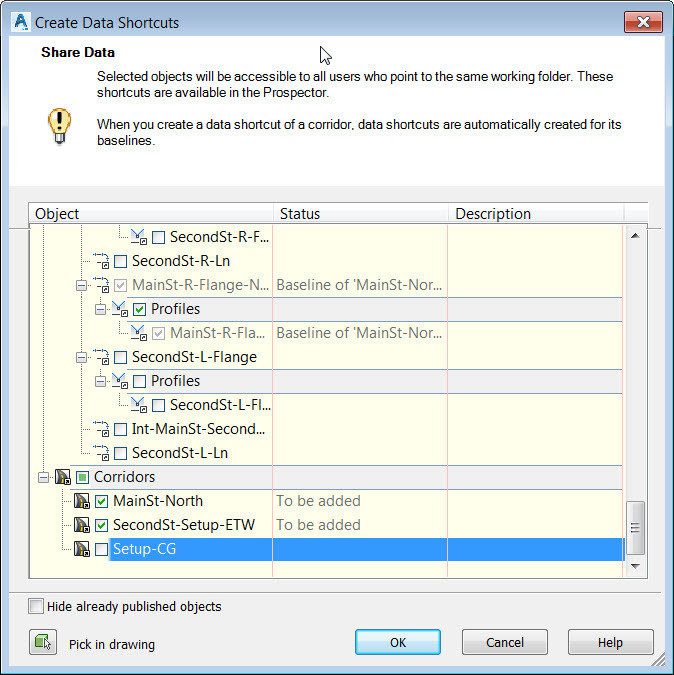 Creating data shortcuts for sharing data in the form of Civil 3D objects is nothing new. However, until now this functionality did not extend to corridors. The typical workflow when creating cross section views for a corridor project was to XREF the corridor file into the section drawing, data shortcut the alignment to create sample lines from, and then the corridor data would be sampled through the XREF to be shown in the section views. Over the years there have been issues sampling corridors through XREFs. Early on the user needed to be sure that the sample line frequency matched up with the corridor frequency lines; or the data would not show correctly in the views. There have been issues with labels not showing up, and with the sections remaining static in the section views even when the corridor file had changed and was reloaded as an XREF. Those issues should all be a thing of the past now that Civil 3D 2017 has introduced the ability to create data shortcuts for corridors. The corridors will now show up just like any other Civil 3D object type within the Create Data Shortcuts dialog box. Create a data reference to the corridors in any project drawing just as you normally would. To me, this is certainly another good reason to move to Civil 3D 2017.